The nation's favourite bedtime story in a board book format, perfect for little hands. A mouse took a stroll through the deep dark wood. A fox saw the mouse and the mouse looked good. Walk further into the deep dark wood, and discover what happens when a quick-witted mouse comes face to face with an owl, a snake . . . and a hungry Gruffalo! 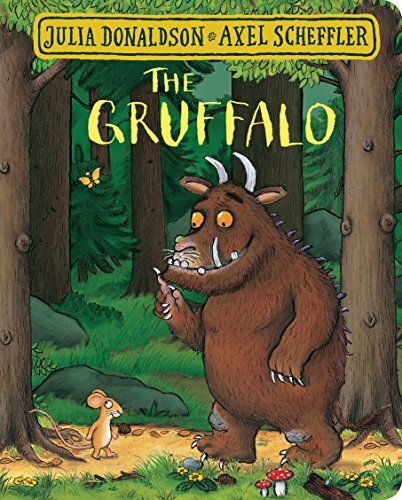 Julia Donaldson and Axel Scheffler's The Gruffalo is an undisputed modern classic and has become a bestselling phenomenon across the world with over 13.5 million copies sold. This award-winning rhyming story of a mouse and a monster has found its way into the hearts and bedtimes of an entire generation of children and will undoubtedly continue to enchant children for years and years to come. No home should be without The Gruffalo! This handy board book format is perfect for younger readers. It features the classic story with a stunning redesigned cover and beautiful finish, making it a must-have for even the smallest Donaldson and Scheffler fans! Also available in board book format and with striking redesigned covers are: The Gruffalo's Child, Room on the Broom, The Snail and the Whale, The Smartest Giant in Town, Monkey Puzzle, Charlie Cook's Favourite Book, and A Squash and a Squeeze.